Offerman will open the national tour of All Rise in Adelaide on June 2, before taking it around the country to Perth, Melbourne, Canberra, Hobart, Sydney and Brisbane. Tickets for all shows go on sale at 2pm AEDT on Thursday, February 7. Offerman is an accomplished entertainer known for Parks and Recreation (2009), The Founder (2016) and Fargo (2014). His role as Ron Swanson in Parks and Recreation earned him a Television Critics Association Award in the US for Individual Achievement in Comedy. He is also a two-time nominee for the Critics' Choice Television Award for Best Supporting Actor in a Comedy Series. His first major television role since the end of Parks and Recreation was Karl Weathers in the acclaimed series Fargo, for which he also received a Critics' Choice Television Award nomination for Best Supporting Actor in a Movie/Miniseries. As a writer, Offerman has published four books(All New York Times Bestsellers): The Greatest Love Story Ever Told (with his legendary bride Megan Mullally) (2018),Paddle Your Own Canoe: One Man's Fundamentals for Delicious Living (2013), Gumption: Relighting the Torch of Freedom with America's Gutsiest Troublemakers(2015), and Good Clean Fun: Misadventures in Sawdust at Offerman Woodshop(2016). While having earned massive recognition for his work on-screen, Offerman also thrives on stage in front of a live audience. His solo show Full Bush was critically acclaimed when he brought it to Australia three years ago. 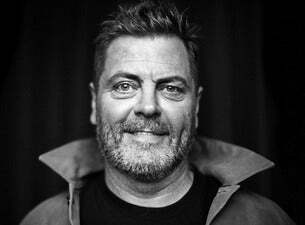 Don’t miss Nick Offerman’s Australian return in All Rise in 2019.